Eero Aarnio's Bubble Chair from 1968 is based on the idea of Aarnio's iconic Ball Chair. 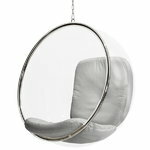 Like the Ball Chair, the Bubble Chair has a simple shape – a ball – but is made of different materials and does not have a pedestal but hangs from the ceiling! Eero Aarnio commented on the design: “After I had made the Ball Chair I wanted to have the light inside it and so I had the idea of a transparent ball where light comes from all directions. The only suitable material is acrylic which is heated and blown into shape like a soap bubble”. Thanks to its special acoustics and soft leather seat, it will be like feeling pleasantly isolated even with many people around. 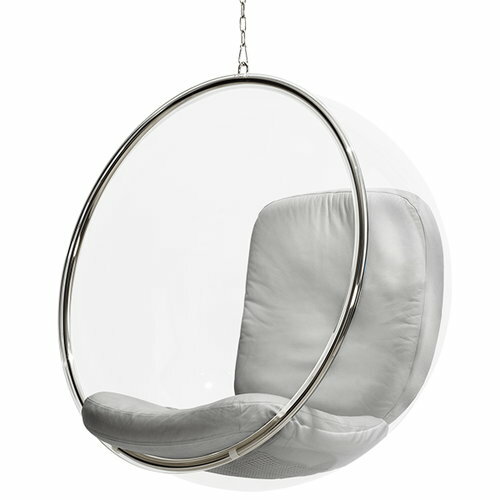 Like the Ball Chair, also the Bubble Chair has become a well-known and desired piece of furniture all over the world. Shell of acrylic, chromed steel bar, two meter chain and hooks. Recommended ceiling materials: solid concrete (use min. wide 10 mm hook) or steel / wooden beam (use min. 8 mm wide steel wire). Fixing materials are not included.